That was the idyllic summer when the fishing bug sank its fangs into me and infected me for life. I was too young to work, too young for girls, but old enough to wander off by myself. So I fished every day, all day. A muddy ten-acre pond lay over the hill behind our house, a four-minute walk for a kid who couldn’t wait to get there. That pond was a magical place for an eight-year-old boy. It churned with warmwater life–frogs, turtles, dragonflies, muskrats, raccoons, minks, herons, ducks . . . and fish. Wondrous fish. Bluegills, pumpkinseeds, crappies, yellow perch, horned pout, pickerel, suckers, eels, and now and then a stunted largemouth bass. Now this was a strange notion. 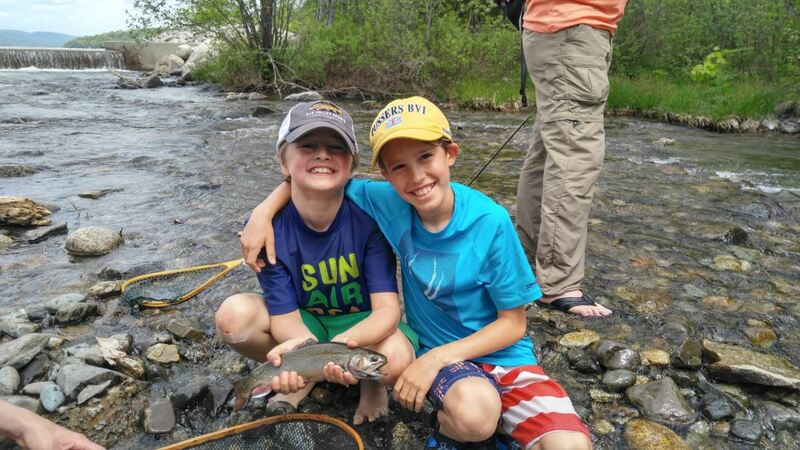 I already had my own fly rod, and for a clumsy kid I was pretty handy with it. It was a three-piece eight-foot Montague. Maybe I knew my Montague was a cheap, mass-produced stick, but the bamboo was the color of beautiful burnished bronze, and my Pfleuger Medalist reel had a musical click when I stripped line off it. My outfit was the envy of the neighborhood kids, most of whom used either Zebco spincasting outfits or steel telescoping rods with old baitcasting reels taped to the handle. I did a lot of digging in our vegetable garden that summer, and I found that with my sweet Montague fly rod, I could lob a gob of worms pretty far out there without losing my bait. I didn’t know it was called a roll cast. But I could do it. But I knew better than to question my father. So I followed him into the woods out back, where he began narrowing his eyes at the clumps of saplings that grew there. After a lot of frowning and shaking his head, he selected a straight-growing poplar whip. It was about ten feet long and a little less than an inch thick at the base. He handed me his pocketknife, and I cut down the sapling, trimmed the leaves and twigs off it, and waved it in the air. I handed it to him, and he made casting motions with it. “Perfect,” he said. We peeled the bark off it and cut a foot off the tip, then took it home and rigged it with butcher’s twine. What, I wondered, was wrong with my slick Montague bamboo fly rod? But I didn’t ask, and he didn’t explain. So I obeyed my father and took my new pole fishing. After that slender Montague, my poplar pole turned out to be heavy and stiff and clumsy. I couldn’t roll cast with it for beans, but after a while I got so I could lob a bobber-and-worm far enough out there to catch perch and horned pout and derrick them in. Success is sweeter when you figure it out yourself. I stuck with that pole for about a week before I started sneaking out to my pond with my Montague fly rod. I never told Dad that I’d hidden our homemade poplar pole behind the woodpile. Luckily for me, he didn’t ask how it was working, because I’d prepared a lie about how I busted it hauling in a big sucker, and I didn’t like lying to my father. I felt guilty enough as it was. For some reason, it was important to him that I fish with that clunky pole we’d cut from the woods. Pretty soon, when he saw that I was truly and forever hooked on fishing, Dad started taking me with him. We traveled all over New England–usually just the two of us, but sometimes with one of his adult fishing pals. We trolled streamers for landlocked salmon, we cast dry flies for trout and deerhair bugs for bass, and sometimes we used fly rods to drift worms in little woodland streams. Dad and I went off fishing just about every weekend from April through September. That was my childhood. I was a lucky kid, and lucky me, I knew it. In all that time, I don’t recall my father ever once giving me a fishing lesson. He insisted I learn the Turle knot (for tying a fly to a leader tippet) and the blood knot (for tying tippet to leader). After that, I was on my own. I learned to cast a fly the way I learned to lob a gob of worms out there–by trying and failing and trying it differently until it began to work better. I learned where fish hung out by putting my worm or fly in different places and letting the fish guide me. I suspect Dad had to bite his tongue a thousand times. It would’ve been easy for him to say, “No, no. Do it this way.” But he never did. We just went fishing together. He did it his way, and I did it mine, and you can be sure I watched him closely, because it was pretty obvious that his ways worked better than mine did. A hundred times when I was growing up, and even years afterwards, I thought about asking my father why he’d insisted I fish with that poplar pole. But I never did. Maybe it was the guilt I never quite kicked about hiding the clumsy old thing behind the woodpile, though I have a strong suspicion that he knew exactly what I was doing. Eventually I had three kids of my own. They all showed interest in fishing, and I was sorry that we didn’t live in a house with a warmwater pond just over the hill out back. I never did cut them a poplar pole. Maybe I should have. But I did spent a lot of time in canoes with each of them, and I found myself biting my tongue and letting them fool around until they got the hang of it. I remembered the satisfaction I had felt whenever I figured something out for myself, and I didn’t want to deprive my kids of that feeling. Home-made poplar poles, butcher’s twine, cork-stopper bobbers, gobs of garden worms, suckers and eels–they’re every angler’s legacy, and if you skipped that part, well, when it’s time to take a kid fishing, cut her a proper pole and resist the impulse to tell her how to use it. Let her begin at the beginning. You’ll see what I’m talking about. And visit Vicki Stiefel’s new website and facebook page to learn about her new book, Chest of Time: Book 3, The Afterworld Chronicles and the reissue of her Tally Whyte series.